Right after tonight's Michigan/Wisconsin hoops game (Go Blue! ), the Heins will tune in for the Academy Awards, which aren't exactly bursting with excitement this year. Can't wait to see what Chris Rock is going to do, but after that, it's all about the picks. Last year, I nailed 'em all except for Best Picture, where I flip-flopped from Birdman to Boyhood. Still stings. This year, I think I learned my lesson. Might as well start with the toughest category of the night. JJL is always great, Rooney Mara held her own with Cate, Rachel McAdams was also pretty good in True Detective, and Kate Winslet can do anything. Excellent performances all around, but Vikander is the one who shines above all others (she really stands out in Ex Machina). I thought The Danish Girl dragged quite a bit (pun not intended), but Vikander more than held her own during Eddie Redmayne's transformation. She will punch the Oscar winning ticket that I'm sure Eddie expected. If Winslet takes this, it could be an interesting night. Rocky...Rocky...Rocky. This is Hollywood, people. Bale was quirky and fabulous as always, Hardy continues to be underrated and not appreciated, Ruffalo was stellar, and Rylance gets lost in the shuffle. This category goes the sappy route, and Stallone's story is too good for Oscar to pass up. And by the way, he is VERY good in Creed. Very strange when Jennifer Lawrence comes up fifth in an Oscar category, but she does here. Charlotte Rampling is a stellar actress, but she's not winning this Oscar. Cate Blanchett is too good these days - quickly drifting into Streep territory. Saorise just picked the wrong year - this one belongs to Brie. And how can the kid in Room not be nominated? That's just wrong. Matt Damon is always solid and The Martian is entertaining, but not Academy Award worthy. I love Bryan Cranston, and he's great in Trumbo. He's got Emmys. Eddie Redmayne got his win - not gonna happen again this year. Fassbender will get one down the road, but his Steve Jobs felt like an Emmy winner, not an Oscar winner. Leo is too tempting for Hollywood to resist, and he's paid his dues with other projects. Slam dunk. This one kills me. McCarthy and Abrahamson have much to be proud of, but they are 4th and 5th in this horse race. McKay did a great job making financial material interesting and deserves kudos, but not an Oscar. George Miller DESERVES this Oscar. All of those practical effects in Mad Max: Fury Road are nothing short of amazing. He's in his 70's. Hollywood should eat this up. But they won't. I think Leo fever plus Inarritu's recent success and acclaim will bring him a second Oscar. I wouldn't mind being wrong here. Let's narrow this down quickly. Bridge of Spies, Brooklyn, The Martian, Room - all good films, thanks for playing. The Big Short tells one heck of a tale, but it ain't Best Picture. Mad Max: Fury Road was an incredible ride, but there's no way it's taking home the big prize. That leaves The Revenant and Spotlight. The Revenant is getting its acting and directing Oscars, and it doesn't need (or deserve) this one. I know Hollywood loves this movie and it's got so much buzz that it's tough to resist, but I'm holding back. Spotlight had it all - excellent screenplay, direction and very fine acting. Plus a story that could have been portrayed in a completely different way, and it wasn't. It is the best movie I saw this past year, and I think it will win Best Picture. I also thought Boyhood would carry the day last year. Remember, the best man/woman/film doesn't always win (or even get nominated). This is Hollywood after all. I'm behind on my TV, but I've got a good reason. Fast Food Maniac was released on Groundhog Day, and folks seem to be enjoying what I wrote, which is nice. I did some book signings at WORD in Jersey City, Barnes & Noble in Tribeca, and Book Revue in Huntington, Long Island. It was nice to see that bookstores do still exist, and I should do a better job supporting the indies. Thanks to everyone who came out in the cold metro NY area weather. 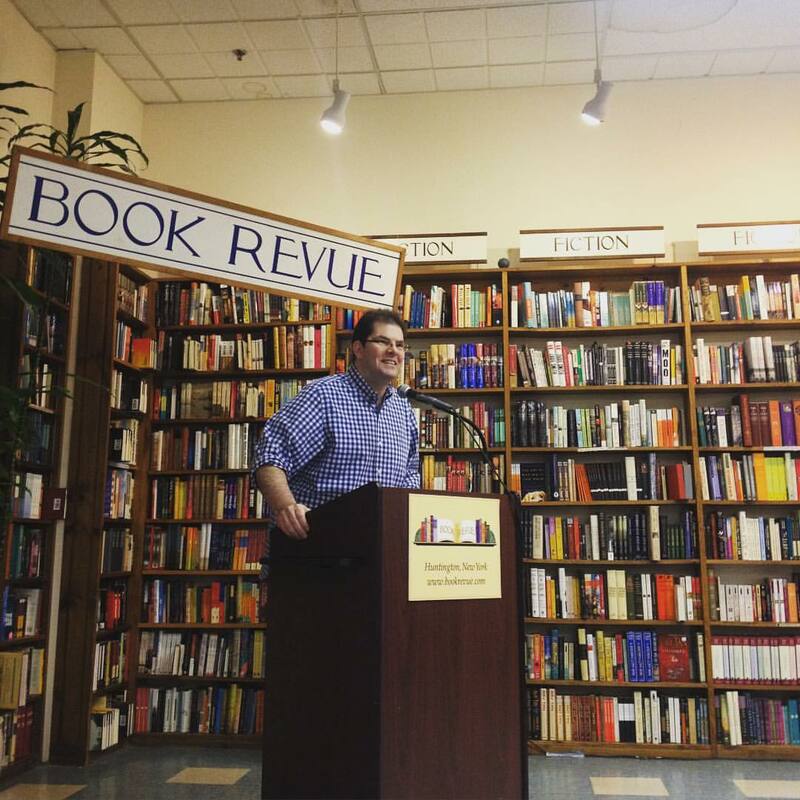 Looking presidential at Book Revue. 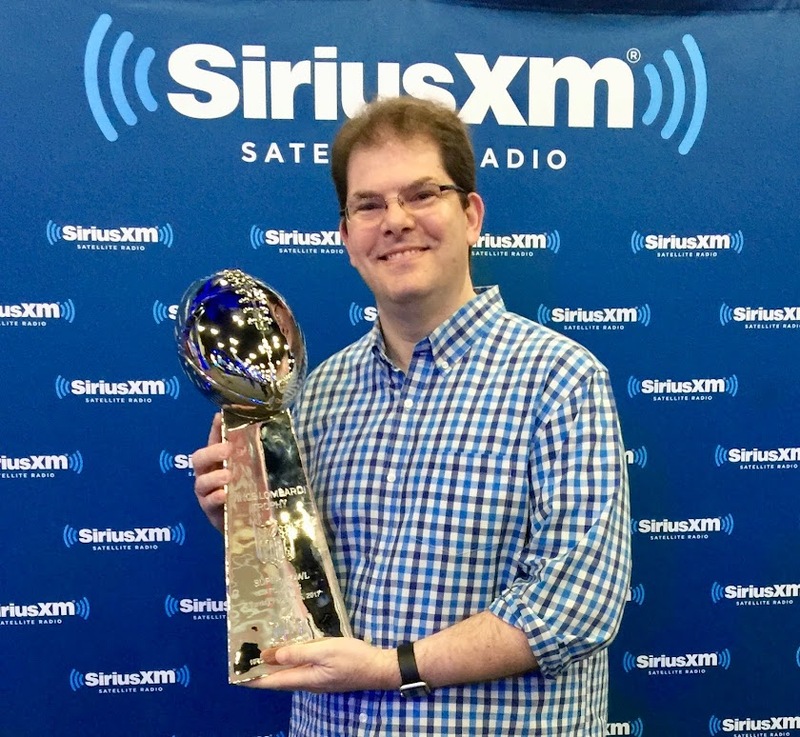 Robin mentioned my book on the air right before the show took a vacation break, but I have a feeling now that my audio book is out, that won't be the last time you'll hear about it on the Stern show. Fast Food Maniac has been a #1 New Release in a bunch of Amazon categories including Humor: Cooking and Travel Dining Reference. There are a ridiculous amount of categories on Amazon. Amazon also chose the book as one of the Best of the Month for February, which is very cool. 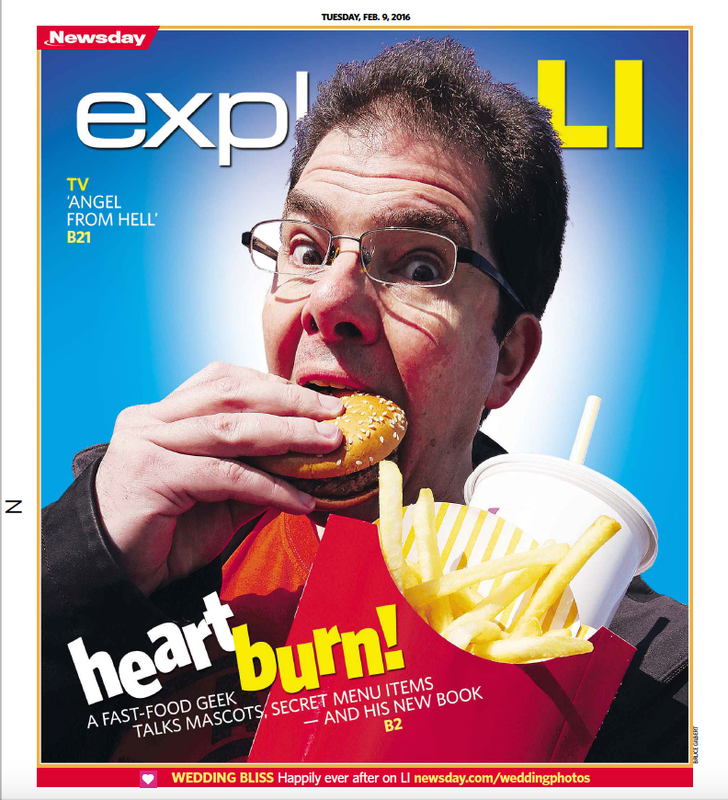 I also made the cover of Explore LI in Newsday (Long Island's newspaper) and Men's Journal wrote a nice piece. There are some more articles coming that I look forward to reading. Not the most flattering shot, but gets the job done. So what's next? I'm really not sure. I will be returning to MLB Now this Friday and will work fast food into a conversation about Spring Training. I don't have any other signings scheduled, but if I take a trip and there's enough interest, I'm happy to create one on the fly. Hoping for Pittsburgh, Ann Arbor, or other towns that I frequent and love. For those who have been generous enough to buy the book, thank you. For those who haven't, what are you waiting for? 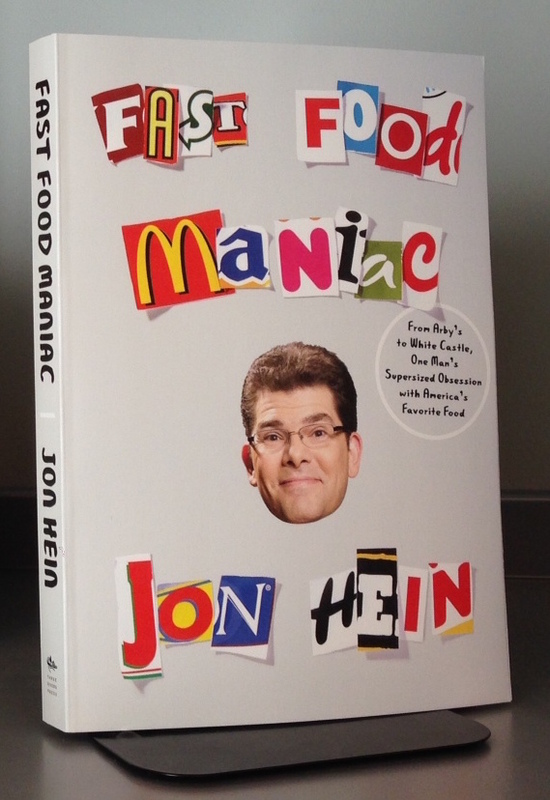 If you would like to purchase a signed copy, please email me at fastfoodmaniac@gmail.com and we'll get it done. 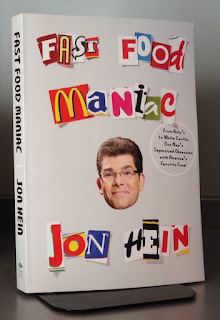 I'm anxious to hear what you thought of Fast Food Maniac. It was fun writing those reviews and making all those lists. I hope you enjoy reading it as much as I enjoyed writing it.